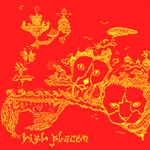 The Brooklyn-based duo High Places are most often compared to Beat Happening, a band cherished for their regression-- into musical primitivism, adolescent sexuality, and any other condition that twenty- and thirtysomethings bemoan the loss of in therapy. High Places' indulgence in nursery rhymes aside, the kinship is mostly an ideological one: Like Beat Happening, they exult in the simple. 03/07 - 09/07, a collection of the band's first 7" and stray compilation tracks (released through the mp3 subscription service eMusic), shows a group whose comfort zone isn't the folky imperative, but heady, hippyish imprecision. The songs here are almost all identical: polyrhythmic miniatures built by small drums and shakers, clouded by blankets of echo and reverb; deliberately basic structures; short, and in their own way, catchy and pretty. Rhythms suggest provinces a step removed from where other white, arty urbanites tend to dwell: There are flashes of soca, reclined bounces that remind me of Indian music, and though "Sandy Feat"'s swing could be Tom Petty's "American Girl" or David Bowie's "Modern Love", they inflect it they way Brazilian bands like Os Mutantes did (or Paul Simon on Rhythm of the Saints). Pearson's vocals and the duo's lyrics are charmingly coquettish: She reduces falling in love to "Oh, you're a pretty boy, a pretty boy" and writes letters to Martians. "Jump In", penned for Pearson's Michigan elementary school, is so full of encouragement that it scans like the transcription of a guidance counselor or junior minister. "Canary" apologizes to animals displaced by ecological warfare-- "we really messed up." The sentiments are frank, but I out them for three reasons: There's nothing wrong with being positive, the band's confident enough to handle it, and they make me happy. "Universe"'s lyric makes this clear: "It takes a lot of guts to be a little baby in this place." The idea of returning to infancy might resonate as a dippy bohemian nightmare, but in a society where moderate cynicism is considered a higher road to intelligence than acceptance and curiosity, and where sarcasm is considered a social reflex, you'd be hard pressed to argue with them-- it does take guts. Brooklyn duo infuses minimal indie pop in the Beat Happening vein with touches of exotica and syncopated beats, resulting in four short songs that are lo-fi and simple but strange enough to get lost in.